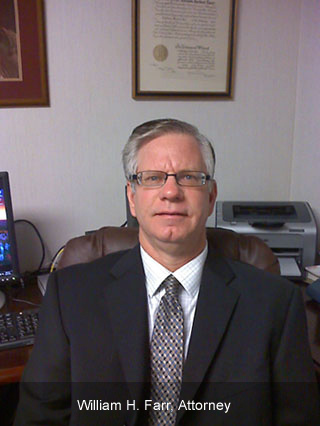 Webster and Rochester area lawyer for divorce, injury, real estate, DWI, Traffic, Estates and Wills. William Farr Law firm is here to help. Our practice is conveniently located in Webster and upon request, offers evening and weekend appointments to accomodate your busy schedule. As your sole attorney, you can expect dedicated communication with me. Unlike the high degree of specialization seen in many large law firms, I am a generalist and engage in challenging, highly varied work across the broad spectrum of practice areas. Our culture is friendly and relaxed. Most new clients are referrals given as a result of satisfaction with our firm.